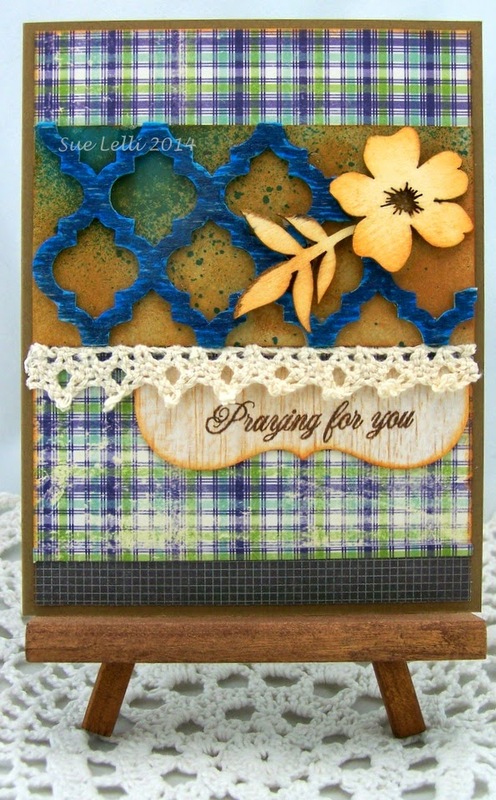 I used the Tim Holtz Alterations Frameworks Trellis Die to cut out a piece of balsa wood. I first sprayed the wood with Dylusions Ink Spray in London Blue and then I colored it with a blue Faber Castell Big Brush Pen to give a two-toned wood grain look. The kraft paper background underneath the lattice is a piece of kraft paper that was the recipient of some Dylusions Spray Ink! I thought the spray and splatters made an interesting back drop! The wood flower and leaf are from Prima. 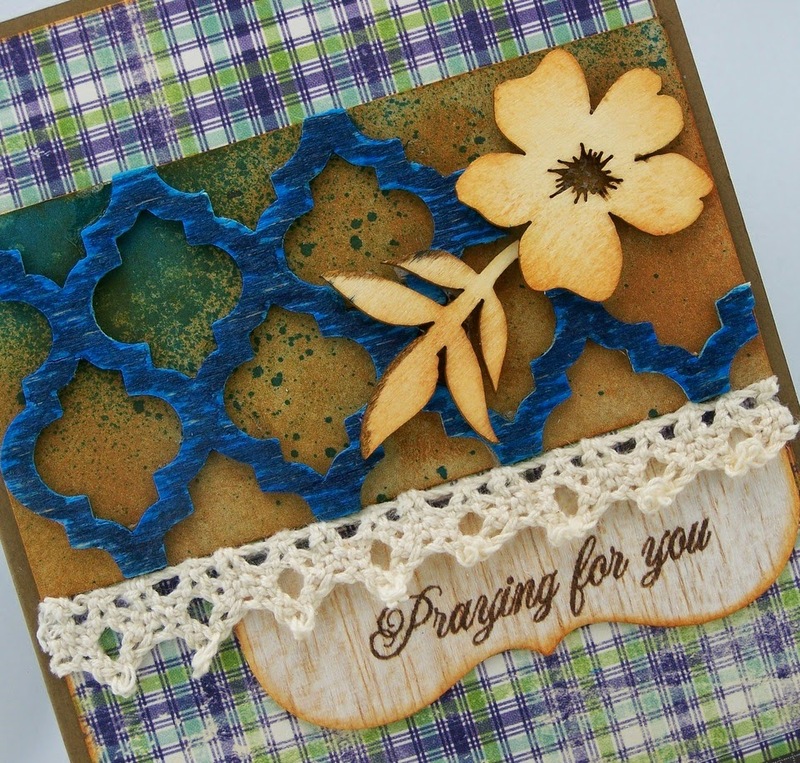 The "Praying for you" was stamped with WV Archival Ink in potting soil on a die cut piece of balsa wood and the edges were distressed with TH Rusty Hinge Distress Ink. All of the other edges were distressed as well. The plaid paper is from an Authentique Suave 6x6 paper pad. LOVE! I hope you like my card and are inspired to play with our ePlay Challenge ~ Wood! We would love to see what you create plus you can win a $25 shop voucher to the eclectic Paperie store! This is a beautiful card, love the colors ... and the details are amazing ! What a neat idea Sue, love your card!! The colors are so pretty too. What a nice use of wood Sue! The colors are subdued enough for the tone of the sympathy - but has lots of interest with the plaid, splatter and bloom! Gorgeous card, Sue! My deepest sympathies to your friend. Uuhhhh, I've never tried to use the dies to cut balsa wood. Awesome card, will have to definitely give it a try. Love the colors on the Kraft card stock. Gorgeous. So beautiful Sue,sorry to hear about your friends loss. Note to self~Life is Good! Say it with wood . . .